leg | eat. drink. cook. travel. I know I feature way too many pasta dishes, sorry. I don’t cook as much as I’d like and lately things have been crowding in. I’d love for an entire weekend of leisurely cooking at some point soon. In the mean time, this will have to suffice. I like chicken baked in the oven plain and simple till the juices flow and the skin is crisp. Poured onto warm pasta, it makes a simple dish incredibly yummy. This time I thought I’d use some cherry tomatoes and roast them over low heat in a frying pan. Slip in some crushed garlic and the juices come out sweet and aromatic. Let the mixture cook slowly over low heat to intensify the juices while the pasta cooks. 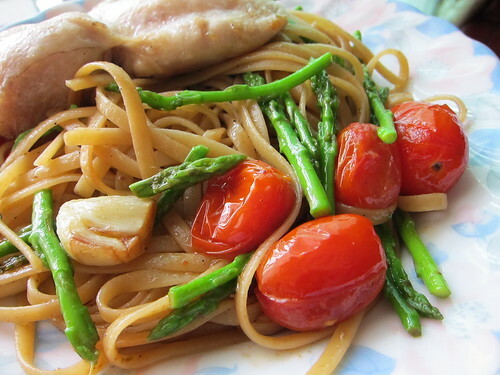 Pour in the chicken juices, toss in the asparagus spears at the last moment, then mix with the cooked pasta. Season with plenty of freshly grounded black pepper and sea salt and a great lunch is served. Here’s the recipe if you must. Separate the skin from the deboned chicken leg and lay each flat on a baking tray lined with aluminium foil, taking care that they are far apart enough that the juices stay away from the skin. This way the skin becomes nice and crisp. Bake for 20 minutes or until chicken is done. If the skin isn’t crisp yet, grill till it is. Let the chicken sit and cool so the juices ooze out. In the mean time, heat the olive oil gently in a frying pan and then sweat the garlic and tomatoes till just on the verge of brown. This takes a while, so be patient. Cook the pasta in plenty of salt water till al dente. When the pasta is just about ready, pour the chicken juices into the frying pan and turn up the heat. Toss in the asparagus and stir till just cooked, about 30 seconds. Now toss in the pasta and stir till the noodles are completely coated. Season well to taste with salt and pepper. Turn onto plate, top with chicken and crispy skin and dig in!